The Golden Rams capped-off yet another solid week of play (21-12 overall), finishing with conference wins (2-0) over Kutztown University. Meanwhile, sophomore pitcher Jen Hanshaw, Mechanicsburg, Pa./Cumberland Valley, earned PSAC East Pitcher of the Week honors for the first time in her career after a strong performance a week ago. Hanshaw went 3-0 with her first two wins of the stretch coming in relief appearances against Pace and Chestnut Hill. Hanshaw went five innings between the two appearances as she worked the Golden Rams out of tight spots in both games, allowing just one unearned run. Hanshaw went on to close out the first of last Saturday’s games against Chowan before earning her first start of the week in game two. In game two, Hanshaw allowed just five hits and one unearned run over her five innings of work while striking out of a pair of Chowan batters as well. 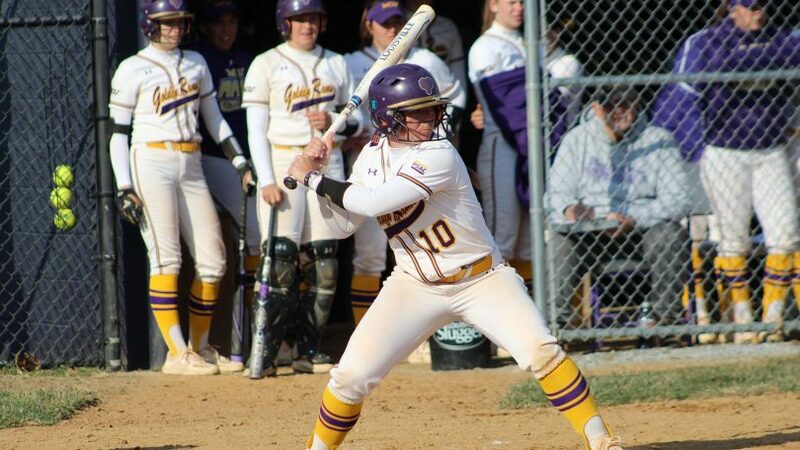 The performance led West Chester to its third shortened victory of the season as the Golden Rams won 9-1 in five innings. Junior Emily Maseth (Westminster, Md./Westminster) led the Golden Rams at the plate for the day going five for seven with three RBIs and three runs scored. “From the last couple games to this game, I made a little adjustment in my stance. Everyone was seeing and hitting the ball well today; it was just a great team performance overall,” said Maseth. West Chester went on to win its next two games at Jefferson — home of the Rams, ironically — by scores of 4-1 in game one, and 7-0 in game two. Junior Reilly Gearhart, Lancaster, Pa./Manheim Township, (10-4) earned the victory for the Golden Rams in game one, pitching a complete game while giving up just four hits, one run and striking out seven. In game two, Redshirt sophomore Maegen Kavanagh, Easton, Pa./Easton, (3-2) had plenty of run support to back up her complete game shutout, giving up just four hits and one walk while striking out six to earn the victory. The Golden Rams’ good fortune did not last too long, though, losing their next two games in a doubleheader Tuesday against the Wildcats of Wilmington University, Delaware. West Chester lost game one in true heartbreaker fashion in the bottom of the tenth inning by a score of 10-9. Not able to recover quickly enough, the Golden Rams were then wiped out 7-3 in Game two. By the end of Friday, however, West Chester was able to recover and gain back some momentum with conference wins over Kutztown. The Golden Rams won both contests by a scores of 8-2 in game one and 8-4 in game two. West Chester currently sits atop a very early PSAC standings, with each team having only played two games or less of conference play. Nevertheless, Junior second basemen Bri Garber, Willow Street, Pa./Lampeter-Strasburg, is confident by the Golden Rams’ efforts. “From here on out, we’re expecting a lot of energy from the dugout, some fun plays in the field and hopefully some more wins,” stated Garber. The Golden Rams’ next contest will be on Saturday, March 30 beginning at 1 p.m. at home against Shippensburg.